... makes me wonder what other beautiful sights I miss seeing while I sleep! BTW, I read the TNR post...AWESOME! Congrats to everyone involved! Well done! 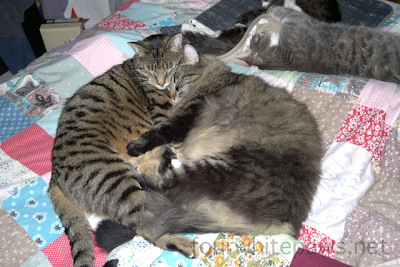 two boys snuggling each other, how cute can they be?! the cutest ever! they occasionally fight but not generally (like brothers). I'm very thankful that all of my indoor cats get along well together and generally enjoy each other! That is a beautiful beautiful sight to see! awwww - that is so sweet!!! It sure is getting to be snuggle season! We see FOUR kitties! That's quite a snuggle pile...almost a HEAP! Awww. I spot Nahum, Theo, Willow, and Buddy's toes and tail, am I right? you successfully identified all the cats! Oh my! that is so adorable!! that is really oh so sweet!